Major multifamily deals stretched across Los Angeles County last month, with Blackstone’s purchase of a 100-unit apartment complex in Santa Fe Springs topping the Top 5 list. Still, the February total of $121 million was less than a third of January’s $391 million in L.A. County. January’s total was propelled by Mack Real Estate Group’s $180.1-million purchase of a mixed-use building in Downtown L.A.
Blackstone Group has been busy expanding around Southern California. In February, its REIT paid $56.7 million to Praedium Group for the 100-unit complex called Miro Apartments in Santa Fe Springs. The purchase is the second time the property at 12257 Heritage Springs has traded hands since 2015. Praedium paid Fairfield $47 million for the property in 2016. 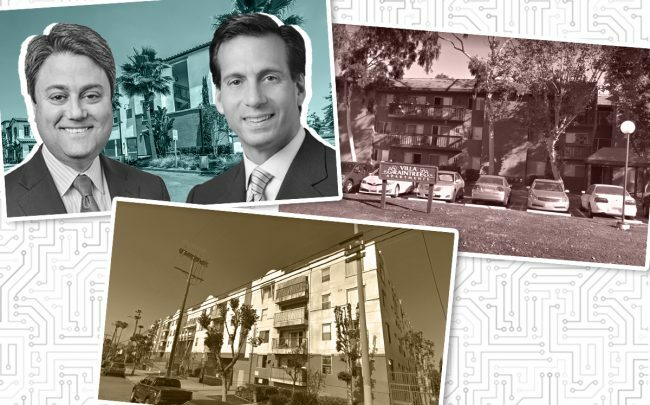 Blackstone entities also recently purchased the former Forever 21 headquarters in Lincoln Heights for $166 million, and sold a three-building apartment complex in Echo Park for $25.5 million. ABS Properties purchased the 125-unit Apple Tree Village apartments from American Housing for $23.5 million. The 143,200-square-foot building is located in the North Hills of the San Fernando Valley. The 1.52-acre property at 9229 Sepulveda Boulevard last sold for $3.1 million in 1998, according to the listing on Realtor.com. Ritz Housing LLC sold the Villa Rain Tree property in El Monte to Thomas Safran & Associates for $16 million. The property has 70 low-income apartments and is 41,700 square feet. The 2.33-acre property is located at 11905 Ferris Road. It was built in 1978 and last sold for $6.1 million in 2006. The building is about 15 miles east of Downtown L.A.
SAFCO Capital and Acacia Capital purchased the 30-unit apartment building at 130 South Alexandria Avenue, near Koreatown and Rampart Village. Owner Ghazar Zehnaly sold the property for $12.4 million, records show. The building was built in 1990 and includes 41,200 square feet. It previously sold for $8.4 million in 2013, and $1.5 million in 1999, according to the listing on Redfin. Owner Daniel Sands sold his 36-unit apartment complex at 1522 N. Formosa Avenue for $12.34 million. The buyer was listed as 1522 N Formosa, LLC, which is registered by Brian Dror, according to property records. The LLC shares an address with an insurance technology firm named Drop In, Inc., where Dror is an executive director. The three-story building was built in 1985 on a .35-acre lot, and includes 24,800 square feet.